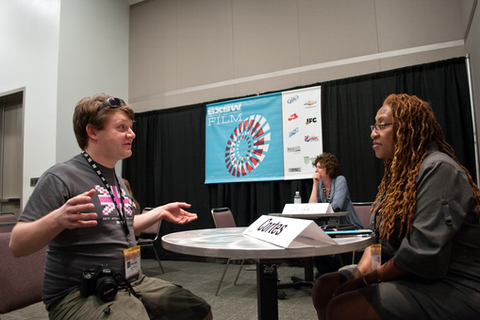 Meet with industry professionals who can give advice and answer questions about distribution, distribution options, and more for narrative films. Uncork'd Entertainment is led by an industry veteran with over 23 years of experience in purchasing, acquisitions, merchandising, marketing and analysis of major studio and independent suppliers to the home entertainment market. Uncork'd Entertainment acquires motion pictures, distributes film for various content partners and consults on digital and Home Entertainment strategies. Matt Grady is the founder of Factory 25, an independent film distribution company launched in 2009. Factory 25 is a home for conceptually provocative narratives and documentaries. Grady’s mission is to deliver specialized film and music titles in an aesthetically captivating way while exposing the indie world to under-the-radar films, music, and other curiosities theatrically, digitally, on TV, VOD, via subscription, limited edition DVDs with vinyl LPs and books. Recent titles include Frownland, The Color Wheel, Beetle Queen Conquers Tokyo and Fake It So Real. Factory 25 headquarters are in Brooklyn, New York. As Vice President for Film Movement, Meghan is involved in film acquisition as well as in dvd, television, inflight and digital sales. Meghan is responsible for helping launch new digital distribution channels such as Film Festival on Demand (cable VOD platform available in 40 Million US Homes). Film Movement has relationships with subscription, transactional and ad-supported VOD platforms in the US and Canada. Meghan has secured company sponsors for the Cable VOD platform. Founded in 2003, the New York-based distributor Film Movement has built a formidable record of releasing innovative independent cinema from across the globe. Established first as a DVD-of-the-month club (“one of the most successful experiments in alternative modes of distribution”—Indiewire), Film Movement has since released 250 feature films and shorts from 50 countries on six continents, demonstrating its commitment to cutting-edge filmmaking and emerging international talents. Having held positions at companies including European Film Promotion (EFP)and Northstar Media selling music docs to international broadcasters, Meghan has extensive international experience and knowledge of the North American and European film and television markets. She has attended various film festivals such as Sundance, SXSW, Tribeca, Venice, Toronto, Berlin, Cannes, and also the MIPCOM & MIPTV markets. Meghan served as a member of the International Rome Film Festival jury. Meghan received her Bachelor of Arts Degree from DePaul University and her European Master of Audiovisual Management in Rome, Italy.